As was widely expected thanks to several leaks to the Wall Street Journal, San Francisco Fed President John Williams has been named president of the (far more influential) Federal Reserve Bank of New York: It's considered one of the most powerful positions within the Fed system - sometime even more so than the Fed chair - with NY Fed Presidents often going on to lead the central bank or serve in other high-ranking government positions (like Tim Geithner). Williams is replacing Bill Dudley, who's retiring later this year. While according to the law it's designated the first among equals, the New York Fed is by far the most powerful of the Fed's 12 regional branches. The New York Fed president is the only regional Fed president with a permanent vote on the Federal Open Market Committee, the central bank's policy making body. The bank also controls the Fed's custody open market accounts, where banks and foreign central banks keep some of their dollar-denominated reserves. The NY Fed is also where the bulk of the Fed's balance sheet asset and liabilities are kept. NEW YORK—The Federal Reserve Bank of New York today announced that John C. Williams has been named president and chief executive officer. His appointment by the eligible members of the New York Fed’s Board of Directors was approved by the Board of Governors of the Federal Reserve System. Mr. Williams will begin on June 18, 2018. Current president William C. Dudley’s last day will be June 17. Mr. Williams is currently the president and chief executive officer of the Federal Reserve Bank of San Francisco, a role he has had since March 1, 2011, when he succeeded former Federal Reserve Chair Janet Yellen. The San Francisco Fed is responsible for the Twelfth Federal Reserve District, the largest by geography and population. Among the unique roles of the San Francisco Fed is oversight of the Federal Reserve System’s Cash Product Office, which is responsible for nationwide cash distribution processes. It also sponsors the Center for Pacific Basin Studies, which promotes cooperation among central banks in the Asia-Pacific region, and the Center for Community Development Investments, which serves as a national clearinghouse for Community Reinvestment Act investment opportunities across the country and promotes research and dialogue in the field. “I am honored to have the opportunity to lead the Federal Reserve Bank of New York and to represent the diverse needs and economic challenges of all people living and working in the Federal Reserve’s Second District and as a member of the Federal Open Market Committee,” said Mr. Williams. “I look forward to joining the talented team of New York Fed colleagues and to carrying out the unique responsibilities entrusted to us to protect the economic prosperity and financial stability of the United States' economy,” he added. Mr. Williams is widely seen as an influential voice on the Federal Open Market Committee (FOMC) and was a strong advocate for policies to stimulate the economy and get Americans back to work in the wake of the Great Recession. He has produced seminal research on such critical monetary policy issues as the Zero Lower Bound and the neutral rate of interest. As CEO of the San Francisco Fed, Mr. Williams has focused on the development of the next generation of Federal Reserve leaders and fostered a culture of innovation, continuous learning, collaboration and mutual respect. He has been a steadfast champion of creating a diverse workforce as well as an inclusive culture at the Federal Reserve Bank of San Francisco. Under his leadership, the bank has made significant strides in achieving greater diversity at all levels, most notably among its senior leadership team. “In addition to his technical expertise and intellect, John’s commitment to community development and outreach is something that I really do appreciate. Under his leadership, the San Francisco Fed is recognized as a center of excellence and innovation in building partnerships that help create economic opportunity for lower income Americans. I’m confident he will bring his energy and passion for community development to the New York Fed and build on the great work already underway,” added Denise Scott, Executive Vice President of the Local Initiatives Support Corporation and member of the search committee. “I welcome John Williams to his new role as president of the Federal Reserve Bank of New York. John is a dedicated public servant, a distinguished thought-leader in monetary policymaking, and a proven executive and public communicator. I have valued his insight and wise counsel during my years at the Federal Reserve and look forward to continuing to work with him in the years ahead,” said Jerome H. Powell, Chairman of the Board of Governors of the Federal Reserve System. Prior to becoming president, Mr. Williams was the executive vice president and director of research at the San Francisco Fed, which he joined in 2002. He began his career in 1994 as an economist at the Board of Governors. Additionally, he served as a senior economist at the White House Council of Economic Advisers and as a lecturer at Stanford University’s Graduate School of Business. Mr. Williams has a PhD in economics from Stanford University, an MSc from the London School of Economics, and an A.B. from the University of California at Berkeley. Mr. Williams, 55, is a native of Sacramento, California. He is married with two sons. 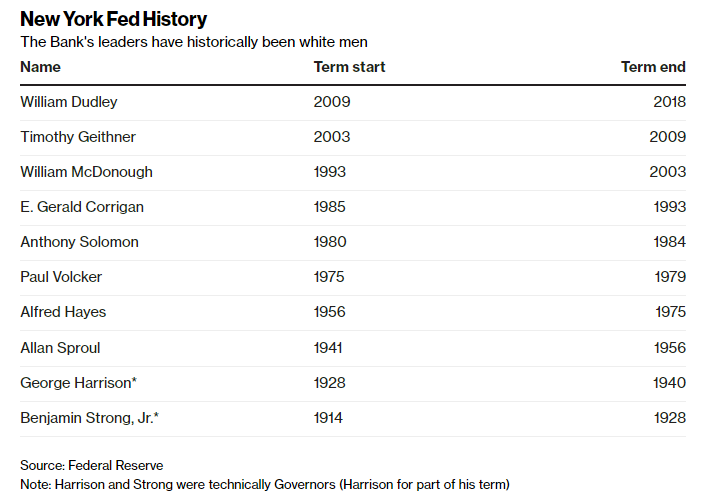 Courtesy of Bloomberg, here's a list of New York Fed presidents going back to the central bank's creation.